It always pays to have fun friends with good ideas. In addition to the adventures you’ll have with them, you’ll get to meet their friends, who are also likely to be fun people with good ideas, who will in turn become your friends, and the happy cycle continues. I know it’s hard to make new friends when you grow up, but I always think it’s worth the effort it takes. Recently I was lucky enough to meet a friend of a friend, now my friend, who had the spectacularly good idea of joining forces to cook an expansive Senegalese menu recently featured in Saveur. I know nothing about Senegalese food, but I’d like to get to know it better if the dishes we made are any indication. 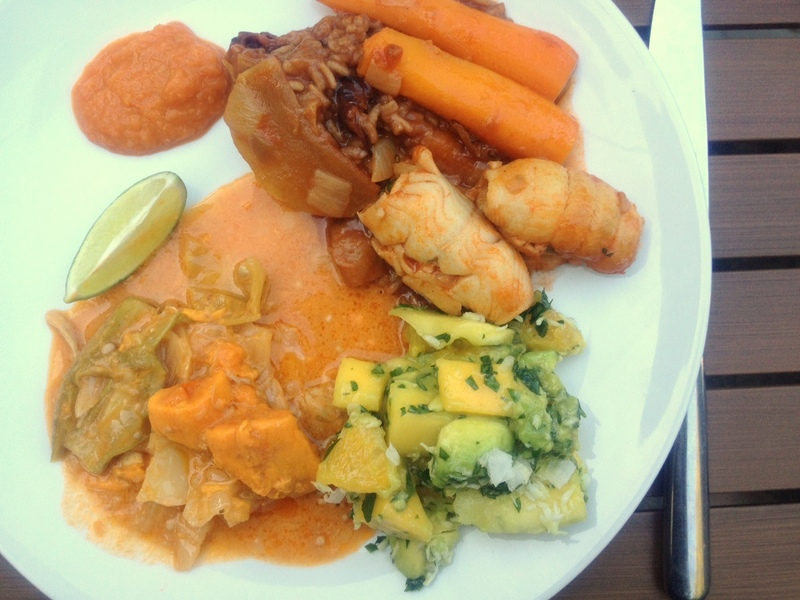 Our menu included deep-fried black-eyed pea fritters with habanero sauce, a peanut and chicken stew, this fish and rice dish, a coconut-topped avocado and mango salad, and a sweet coconut rice pudding. We cooked it all at our house, with five adults sharing the cooking and child-chasing. (This was also the day that J and I canned that batch of raspberry jam.) Sometimes we get a little carried away in the kitchen. Needless to say, we had a lot of leftovers. This recipe is one that we’re likely to cook again. It’s a meal in itself, and although it takes a while to make, at the end you’re left with a flavorful pot of tender vegetables, toothsome rice, and flaky fish. You stuff and simmer the fish in broth, then cook first vegetables and then rice in the same broth, finally returning everything to the pot to warm up before piling your plate high. The pot is fragrant with garlic and tangy with tamarind, a deep flavor brightened with a squeeze of lime. This dish should easily serve 6-8 alone, but feel free to make five or six additional recipes alongside it if you’re feeling ambitious or feeding the whole neighborhood. Finally, a word about the fish. The original recipe calls for 8 4-oz. filets of grouper or snapper that are thick enough to slice horizontally and stuff. Standing in front of the fish counter late at night and consulting the Monterey Bay Aquarium’s seafood watch website on my phone, I selected thin Dover sole filets instead, and rolled them up with the stuffing inside. I suspect that any sturdy white fish fillets will work. Senegalese Stuffed Fish and Rice: First, prepare the fish. Roll or stuff about 2 lbs. of fish filets (depending on their thickness) with a mixture of ¼ c. minced onion, 2 minced scallions, 6 minced garlic cloves, 2 tsp. crushed red chile flakes, ¼ c. parsley, and salt and pepper. Set the fish aside. Heat ½ c. oil in a large, heavy-bottomed pot over medium heat. Saute 2 chopped onions and a chopped green bell pepper with a good pinch of salt until they soften, about 10 minutes. Add 12 oz. tomato paste and continue cooking, stirring occasionally, until the vegetables are completely soft, about 10 more minutes. Add 6 c. well-seasoned fish or vegetable stock and bring to a boil. Reduce heat to medium-low and carefully add fish. Simmer until just cooked through (the time will depend on the type and thickness of the fish you use; it’s done when it flakes when prodded with a sharp knife). Remove the fish from the pot with a slotted spoon, cover to keep warm, and set aside. Next, simmer your vegetables in the broth. You could choose your own assortment of vegetables, but I used 6 halved carrots, an eggplant cut into large chunks, a peeled turnip cut into 12 wedges, and a peeled sweet potato cut into chunks. When all the vegetables are completely tender (about 40 minutes), transfer to a bowl with a slotted spoon and keep warm. Finally, add 1/3 c. dried hibiscus flowers (optional; I happened to have them on hand), 2 Tbsp. tamarind paste, and 2 Tbsp. fish sauce to the stock. Stir occasionally until hibiscus flowers soften, about 5 minutes. Add 2 c. basmati rice, bring to a boil, then lower the heat and simmer until tender, about 45 minutes. (The original recipe called for 4 cups of uncooked rice, but that seemed excessive to me. You can add more if you want.) Return vegetables and fish to the pot for a minute or two to re-warm them. Divide rice, vegetables, and fish among serving plates. Pass lime wedges for squeezing over the fish. 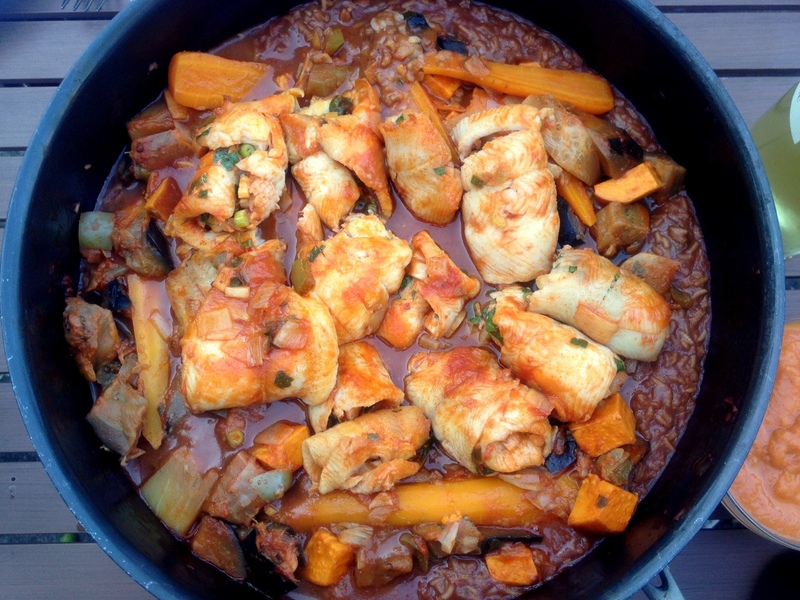 This entry was posted in Easily Multiplies to Feed a Crowd, Fish, Food, Recipes and tagged cooking with friends, fish recipe, fish with rice and vegetables, one-pot meal, Senegalese food on July 30, 2012 by emmycooks. What a wonderful time you must have had. All the dishes sound very good. It was great–and I honestly think it would be pretty amazing with tofu in place of the fish; the fish is mild here and the predominant flavors come from the tomato paste, tamarind, and vegetables. It is so flavorful after cooking for so long! MMmmm, I can totally imagine it. See I need pinterest, I forgot about this recipe all ready and if it weren’t for my comment thread it would have been lost :/ Bookmarking in the meantime! Wonderful! the dishes do sound great. It was all delicious, and fun to discover a cuisine I knew nothing about! I just read that there’s a Senegalese restaurant in Seattle and now I can’t wait to try it! I love this idea of getting together and cooking out of an issue of Saveur! You thiebou dienn looks yummy :-) I remember that from Niger. my program director’s cook was Senegalese and would always make this. It was a little hard to eat at her house though since she had “adopted” a chimpanzee from the national zoo and the chimp would climb the trees above the picnic tables to rain bombs of . . . well, grossness down on you from above. I wish someone made this for me all the time! But the other part, with the chimpanzee–not so much. Yeah. My director thought she was just the cutest thing. We students? Not so much! I was also eyeing up that menu when I got that issue. What a fun day! I definitely recommend this dish and the chicken and peanut stew! The fritters were great, but only because deep-fried-and-salted things are great, and the other dishes were good but less unique than these two. Have you tried any of the Mexican dishes from the new issue yet? I think we might take our menu from those next time! No, I haven’t but my husband did my the Brazilian Fish Stew from the last issue (I think the same one as this fish) and it was insanely good! How fun! And I love the idea of you with your sustainable fish app. I’m always consulting mine in restaurants, much to the annoyance of some of my friends. Happy to see sole as an ok choice, as it’s one of my favorites. The fish sounds so flavorful. I am curious to try cooking with dried hibiscus; I’ve had it in tea before but never in a savory dish, so it should be really fun to make! Preparing a meal with friends sounds like such a fun way to spend time together, and what wonderful memories you’re creating for your children! Not to mention, that fish dish sounds delish! That is why you reign. It’s actually my neighbors who reign; they go to Mexico a few times a year and always bring back amazing treats for my pantry. I guess I should try using the hibiscus flowers in a Mexican recipe next! Nice recipe. Ask your Senegalese friend what is the “Thieboudien dish”. If she’s from around Dakar she will know it very well. What a great dish to have as one’s local cuisine–so healthy and delicious!